There was a moment, on Monday night, as Chelsea slipped to a defeat in the FA Cup, against Manchester United, that caught my eye. The cameras, focussing on the Chelsea bench, as Maurizio Sarri made another predictable substitution, caught young Callum Hudson-Odoi looking towards Sarri. The look the 18-year-old gave Sarri was one that questioned whether the Italian really knew what he was doing, bringing on a defender for a defender when time was fast running out and Chelsea had to chase the game. That look and that moment summed it up perfectly why Hudson-Odoi feels he has to leave Chelsea Football Club to get regular first-team action. Today, the red-top publication, the Sun, continues to discuss just where the England U19 forward might end up. Whilst Bayern Munich have been courting Hudson-Odoi for several months it appears that the French giants, Paris Saint-Germain, are also keen to acquire his talents. 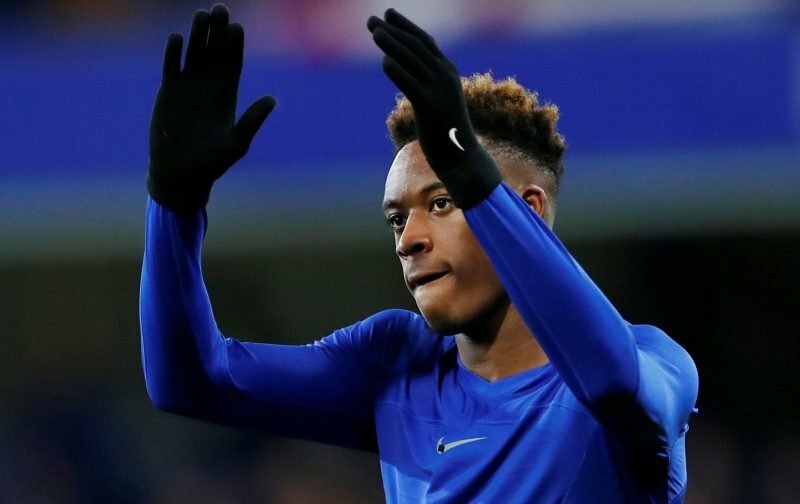 Now I’m sure you’ll all agree with me when I suggest that I’d like Hudson-Odoi to remain at Stamford Bridge, but, the only way I can see that remotely happening is if Sarri is axed and somebody is brought in who appreciates just what a golden future Hudson-Odoi has in the game. Otherwise, it’ll be adios to the youngster and if he is to leave Chelsea then I have t admit I don’t really care where he goes, as long as it isn’t to Tottenham Hotspur or Liverpool.